My collaboration and friendship with John Bell is recollected. I will explain his outstanding contributions in particle physics, in accelerator physics, and his joint work with Mary Bell. Mary’s work in accelerator physics is also summarized. 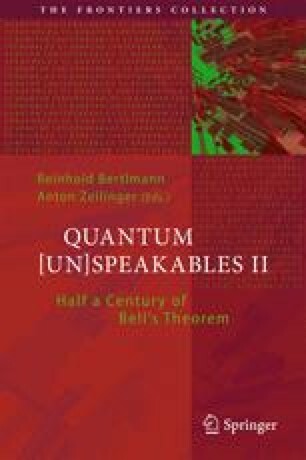 I recall our quantum debates, mention some personal reminiscences, and give my personal view on Bell’s fundamental work on quantum theory, in particular, on the concept of contextuality and nonlocality of quantum physics. Finally, I describe the huge influence Bell had on my own work, in particular on entanglement and Bell inequalities in particle physics and their experimental verification, and on mathematical physics, where some geometric aspects of the quantum states are illustrated. Dedicated to Mary Bell, John’s lifelong companion. First of all, I am grateful to Mary Bell for the generosity of sharing her memories of her scientific career and her life with John. Many thanks, of course, to all my collaborators and friends, to Beatrix Hiesmayr, Nicolai Friis, Walter Grimus, Philipp Köhler, Heide Narnhofer, Gabriele Uchida and Anton Zeilinger, for the exciting and joyful discussions we had together. Last but not least, I would like to thank Renate Bertlmann for her lovingly company and continuous support in all that years.